Have you ever started dating a man and immediately, you’re walking on eggshells? It’s not that he’s a bad guy or that he’s being inconsistent with you. It’s just that, for the first time in a long time, you’re EXCITED about a man. Even though you like your new guy as much as anyone in recent memory – even though things have been nothing short of perfect for these first few weeks – you feel a pit of dread in your stomach. I don’t blame you for a second for feeling all of those things. Naturally, you want to minimize your chances of getting hurt. But what’s the RESULT of this fearful, walking-on-eggshells mindset? Are you more attractive when you’re confident and carefree, or insecure and uptight? Are you more attractive when you assume your man adores you, or when you live in fear that he might bail like all the rest? Are you more attractive when you’re focused on enjoying the present, or obsessing about what might happen in the future? If they want to call you, they’ll call you. If they want to introduce you to their family, they’ll introduce you to their family. Which is why, when you want to know what you should do about the guy who makes you weak in the knees, the answer couldn’t be more simple: NOTHING! “Doing something” means you’re trying to keep your emotional tether alive – to nudge him into calling you, seeing you, or committing to you. But the great thing is: The right man for you won’t need to be nudged! You make other plans or take YOURSELF out! Why? Wouldn’t it make more sense to call him, text him, and see him so he doesn’t lose interest in you? Nope! “Nudging” a man to take action only lets him know that he’s in control, that you’re desperate and needy, and that you don’t trust that he knows what’s good for him. The truth is, if you’re the right woman for him, you won’t NEED to nudge him. Remember what it’s like when a man’s excited about you? 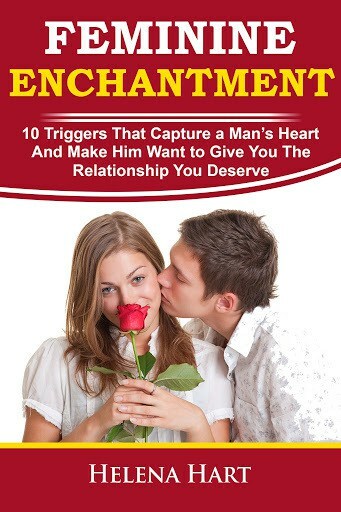 He calls, he follows through, he’s thoughtful, he’s chivalrous, he’s gentlemanly, and he WANTS a commitment with you. But sometimes it takes a few weeks for men to figure all of that out for themselves. Those are things you’ll deal with later. For now, just have fun! Laugh. Say yes. Smile. Enjoy the moment. What you want is a man who’s CHOSEN you on his own accord – and who’s emotionally invested in you because he FEELS so happy every time he’s around you. If he’s receiving texts that say, “Where are you? ?” or late night calls that plead, “Where is this going?” – you’re not making him feel too good in the present. So just relax and enjoy the ride. The RIGHT man steps up to the plate and commits to you. The WRONG man never escalates his efforts and keeps you as an option indefinitely. Why? Because that’s what he WANTS to do. In order to get ANY relationship off the ground, you HAVE to put off all fears, all nudging, and all thoughts of your future – and just ENJOY the present. The right man for you will know what to do next. You’ll be able to distinguish good men from bad men, see what you’ve been doing wrong your entire life, and have all the tools to create the kind of relationship you’ve always dreamed about. 7 replies to "The Secret To Making A Man Fall In Love: Forget The Future, Enjoy The Present"
Great advice! Love this post, thanks Helena! You’re welcome, glad you liked it! The 3 Biggest Dating Truths are very helpful too, especially for strong, smart, and successful women. Nice work, your blog is a great resource! Great post!! I intend to use even more of your info. awesome info!! thank you so much!